Everyone involved with the making of Mission: Impossible – Fallout is utterly mad. Christopher McQuarrie, the first director in this series to return for seconds, is mad. Cinematographer Rob Hardy, who captured everything you see on screen with worrying ease, is mad. Tom Cruise is especially mad, because as we all know the guy does his own stunts when it comes to these films, but this time he may have gone too far. Their shared madness comes from how they were all able to pull off such intense action, jaw-dropping stuntwork, and some of the most daring set-pieces yet seen in not just the Mission: Impossible series but any action series ever, and STILL come out with some semblance of sanity. Seriously, if anyone else was tasked with putting together even half of the stuff that happens in this film, it would make them go insane. But not these guys; the entire cast and crew of Mission: Impossible – Fallout have balls to spare, and have made quite possibly one of the most incredible action movies since Mad Max: Fury Road (though to compare that masterpiece to this one is somewhat unfair, seeing how they are both radically different movies with wildly alternative tones and paces; plus, as fantastic as this movie is, there will never be anything quite as uniquely magnificent as Mad Max: Fury Road). 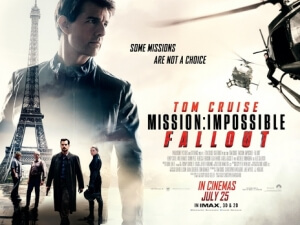 The sixth entry into this increasingly stable franchise – by this point, most other film series would have ran out of gas by the fifth instalment, if not the one before – sees Cruise once again play IMF agent Ethan Hunt, who at the start makes a decision during a trade-off gone wrong, and in doing so allows some high-grade plutonium to fall into the hands of The Apostles, terroristic disciples of imprisoned anarchist Solomon Kane (Sean Harris) who seeks to create nuclear destruction all over the world. Hunt’s mission (should he choose to—oh, you get it) is of course to track down the plutonium and prevent a global catastrophe, but the CIA intervenes and places highly-skilled agent August Walker (Henry Cavill, with his now-infamous moustache that caused panic and hilarity with those Justice League reshoots) alongside Hunt and his team – including regulars Benji (Simon Pegg) and Luther (Ving Rhames), as well as MI6 agent Ilsa Faust (Rebecca Ferguson) from the last movie – on their mission, which involves winning the trust of a beautiful black market arms dealer known as the White Widow (Vanessa Kirby), and travelling all over the world to stop the bad guys before it’s too late. Watching this movie is an utter treat, because not only are you witnessing some of the best writing, acting, pacing and directing this series has ever offered, but you are also privy to some of the most incredibly filmed and fantastically executed action sequences ever put to film. As stated earlier, you have to admire the sheer confidence in every single person involved with the making of this movie, because if this movie didn’t have a solid script or strong direction behind it then it could have all so easily fallen apart. Hiring Christopher McQuarrie to write and direct both this and the previous entry Rogue Nation was perhaps the smartest decision made behind the scenes of this franchise, because here is a guy who really knows how to write compelling characters, snappy dialogue and craft a solid story – hell, he won an Oscar for doing those exact things and more with his script for The Usual Suspects – but also knows extraordinarily well how to use his star to the best of his ability. Having worked with Tom Cruise before as a director and writer on Jack Reacher (not to mention helping to write some of Cruise’s other recent films like Valkyrie, Edge of Tomorrow and, erm, The Mummy), McQuarrie has some level of understanding about what makes this actor really stand out, whether it’s a major action set piece or just a scene where he’s being intimidating and heroic as hell, and with both his entries in this franchise – especially this one – he really sets out to test him like no other director has ever managed to before, and in doing so he brings out an utter beast in Cruise, one that’s fierce but also retains a level of charm that made him one of the most popular actors of our time. This is easily Cruise’s best performance as Ethan Hunt to date, not just physically but also emotionally, as more than any other film in this series we get a sense of what kind of man he really is when faced with extreme and – dare I say it – impossible odds, and when you see him go up against such intense obstacles you really feel the pressure and frustration he exhibits; seriously, when you see some of the stuff he has to do, especially in the last act of the movie, you’ll be wanting his next mission to be just simply taking a nice long holiday, because he’s really earned it by this point. But let’s get back to that action, because it is otherworldly in this film and should make any other filmmaker extremely jealous of the sheer passion and dedication on display here. The many action sequences range from fisticuffs in a men’s bathroom, a car and bike chase through the streets of Paris, a London rooftop sprint which famously saw Cruise break his ankle during its filming (and yes, that shot remains in the film, including his immediate attempt to walk it off afterwards, because of course he bloody did that), and a few others that really need to be seen by your own eyes. You’re just left in utter awe of how it’s all filmed, with cinematographer Rob Hardy making a strong case for action to be recognised in that category come awards season because some of the camera work and lighting here is just unreal, and how Cruise just throws himself – figuratively and literally – into this kind of danger at every available opportunity, with no consideration to his own safety and well-being as that ankle injury clip shows. It’s presented at a digestible pace that allows you to soak up everything that’s going on, and also leaves you breathless as it just goes at such a breakneck speed from the word go (even the opening logos are in fast-motion! ), and the plot and characters are written so brilliantly that you’re emotionally invested as well as physically. This is the kind of action that needs to be studied by future filmmakers, especially if they are aspiring to make something that doesn’t rely too heavily on CGI and just wants to deliver some high-octane entertainment that will keep it going for endless miles. This movie is why summer blockbusters were invented; to offer us an incredibly visceral and entertaining escape into worlds where almost anything is within the realms of plausibility, but also to introduce us to characters we want to see succeed because they’re fun, likeable and always keen to do the right thing. Mission: Impossible – Fallout is one of the very best examples of a pure summer blockbuster adrenalin rush, one that you’re keen to revisit many times over just to pick up on details you may have missed the first time, but also because it’s one hell of a ride that nobody is likely to decline for years to come. Mission: Impossible – Fallout is an absolutely fantastic high-point in the series which also ranks as one of the best action movie blockbusters to come out since Mad Max: Fury Road, one which boasts incredible and jaw-dropping action sequences that make you question the sanity of everyone involved in the making of it, and which also contains a solid plot, strong characters, snappy dialogue and fantastic direction by Christopher McQuarrie who in turn brings out the very best in star Tom Cruise, who is pushed here like never before in stunts and scenes that will leave you utterly breathless. Run as fast as Cruise can to this absolute beast of a movie.